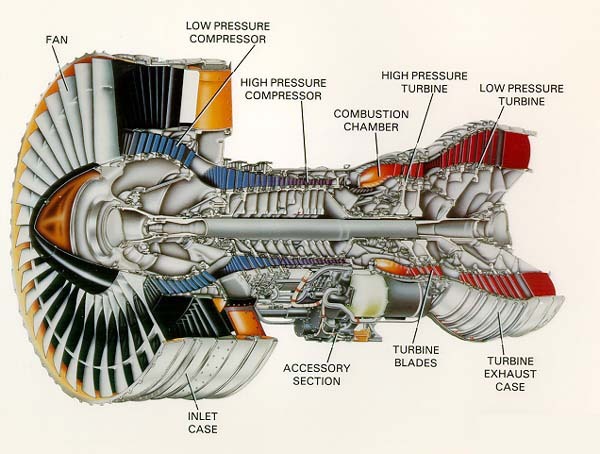 The Picture you are looking at is a cutaway section view of Pratt & Whitney Aircraft Engines’ “PW-4000” Turbofan Engine. It might be hard to believe, but that engine was the key to the design of Black Hawk & Black Swan Putters. Back in 1985, I was tasked to solve a geometry issue with all of the Low Pressure Compressor Stage Blades. Pratt engineers had designed the compressor blades in that section with the root forms and blade stacking axes (CG’s) at various compund angles to the engine axis. It made tool design rather challenging, as instead of having surfaces or axes either normal (90* or cartesian) or single axis angular tipped (X*) to each other, all surfaces were compounded (X*Y*, or double axis angular) to each other. When considering tooling, that made multiple setup tips necessary, and with accompanying offsets in 3-axes. Also, each stage (blade row) was unique, so no common tooling could exist. The supplier company, Ex-Cell-O Aerospace, was making the blades in Orlando. I got a call one day to stop by, and help them out (I was a troubleshooter, and geometry was my thing). In the course of my early work, I uncovered a major problem in all the compound angle calculations the company had been performing for years. All the senior engineering staff thought I was dead wrong… but proof came early enough… a quarter million in tooling I designed that had been rejected by their Chief Inspector proved to be correct upon my demonstrated proof on their granite surface plate, using a compound fixture and test-master on a Cadillac height gage, with the help of a trig-table and calculator. The Chief Engineer assigned me as his Senior Tool Engineer as of that day… fun work if you could get it… and there were always problems to solve. Now, if you fly in Boeing 747’s, 767’s or other airliners, that engine probably carries you to your destination. I’m pleased to say that the company had me do work at multiple facilities over the years, including the new tooling programs for both the blades and vanes for the re-bladed PWA 4084 some years later, training engineers, tool designers, toolmakers, inspectors, and other technical personnel the fundamentals of geometry-trigonometry relating to the design of blades and tooling. I did similar work for other companies over the course of my career, and enjoyed solving countless geometric problems. Of course… during all that time as an engineer… I never thought about the need to re-examine golf equipment design. Why? Because I was a traditionalist on the links. I even used my persimmon MacGregor driver into the XXIst Century. Of course I understood the basic issues, but never spent a moment thinking about them. That all changed in a blink of an eye in the Summer of 2010. I had just completed a two-month long series of putting trials. I was trying to get ready to compete again, and knew it was necessary to putt far better than I had in my youth. Five hours per day, in morning and afternoon sessions, I struggled to “learn to putt”. Using all my statistical knowledge, I designed a series of tests to isolate factors, and develop the most robust technique possible. The result? I steadily got worse. It made no sense. After two months, I quit. Hey, I’m a Dad. Golf wasn’t my life. But the engineer in me couldn’t rationalize getting worse the more I practiced. The clue? A different fundamental problem solving skill that I used for three decades… the science of statistics and probability as it applies to “Process Analysis”… the study of Error, and it’s Elimination. You see, I’m also an Advanced Manufacturing (the guys who get to plan the next generation of production) and Quality Engineer. Here’s the clue… there’s two types of Error… Bias (shift from desired target) and Variance (spread or pattern of error). My putting over two months got steadily worse (fewer putts made). Well, my variance had to be improving, so why did I make fewer putts? The clues came from my experiences with the PW-4000 program. All Putters have a geometry flaw… only solved by a new design paradigm. That’s exactly what we did in designing the Black Hawk & Black Swan putters. Perfect Geometry… at long last. Like what was done in 1985 for turbine engines… now in 2010 for Putters. It’s not that you can’t aim. You do. But you aim using your 2D view of a putter. But it’s a 3D problem. Traditional Putters are the problem. They don’t Putt where you Aim! Perfect Geometry. Putters that Putt where they aim. On every slope. For every player. All the time. No other putters have it. Sorry it took me so long to get around to Putter design!